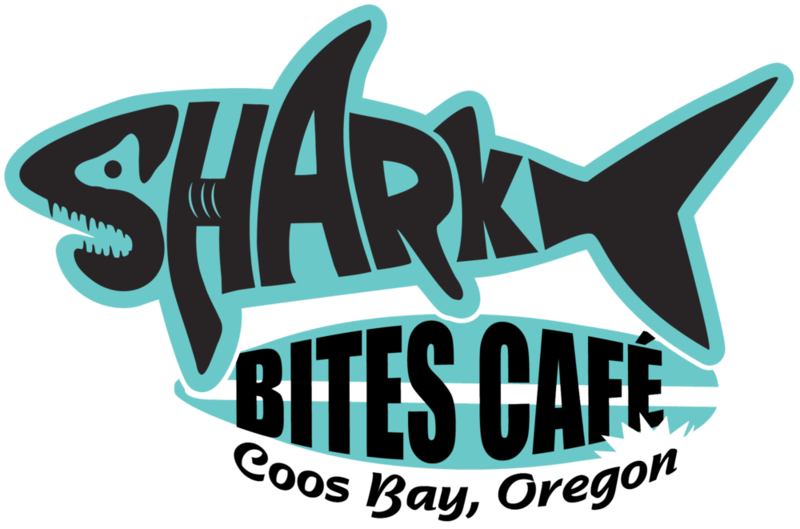 Located right along Highway 101, Shark Bites Cafe is the definition of coastal eats with our locally sourced seafood and delicious eats. SharkBites is the perfect place for family & friends to enjoy great fresh seafood, awesome burgers, famous fish tacos, award winning fish and chips, and more! Brunch is served daily from 11a-1p with great lunch and dinner specials throughout the rest of the day. Equipped with a full bar, Shark Bites helps ensure that the party gets going all night long. Coffee burlap sacks, surfboards, and driftwood decorate the walls of Shark Bite's interior reflecting the relaxed and outdoorsy culture of the Oregon coast. Natural lighting and twinkle lights make up a warm and welcoming atmosphere. Shark Bites also has a section for those who opt for brighter lights and a diner feel ensuring that there's something for everyone. Our twist on French toast made with our fresh baked Kaiser buns then topped with real butter, whipped cream, powdered sugar & syrup. Two free range eggs and two very thick slices of bacon served with your choice of fresh cut French fries, home-style potatoes or fried fingerling potatoes. Wild Alaskan Salmon cold cured and served with avocado, tomato, hollandaise sauce & poached free range eggs. Served with your choice of fresh cut fries, home style potatoes or fried fingerling potatoes. 2 fresh house-made Dungeness Crab cakes topped with poached free range eggs, avocado, tomato & hollandaise sauce. Served on top of our house-baked Kaiser roll. Served with your choice of fresh cut fries, home style potatoes or fried fingerling potatoes. A fried free range egg breakfast sandwich with bacon, avocado, mayonnaise, Swiss cheese and tomato served on a fresh baked Kaiser roll. Served with your choice of fresh cut fries, home style potatoes or fried fingerling potatoes. Slow cooked seasoned black beans, slaw, avocado, fresh cilantro, two scrambled free range eggs, local pink shrimp, onions & tomato. Three house made crab cakes with fresh dill. Served with a sweet chili dipping sauce. Battered to order. Served with your choice of dipping sauce. Half dozen large oysters, dusted in flour & grilled. Served with cocktail sauce & lemon. Well-cooked upon request. Fresh Chicken breast house cut and beer battered. Served with your choice of sauce. Half dozen prawns garlic sautéed, battered or chilled. Served with cocktail sauce & lemon. House corn tortilla chips, black beans, Monterey jack cheese, red onions & your choice of local pink shrimp or grilled chicken breast. Served with fresh salsa and chipotle cream sauce. Tender steak strips lightly seasoned & fried. Cocktail sauce & lemon. Tender pink shrimp seasoned and fried. Served with cocktail & lemon. Healthy portion of local pink shrimp chilled. Serve with cocktail sauce & lemon. Creamy and gluten-free, our chowder is sure to delight with fingerling potatoes, hard salami, fresh herbs and tender sea clams. Served with oyster crackers. Thick & creamy, slightly spicy. Served with oyster crackers. Romaine lettuce tossed with parmesan cheese and our house made Caesar dressing & croutons. Spring mix with local pink shrimp, blue cheese crumble, red onions & avocado. Served with blue cheese dressing. Spring mix, red onions, tomatoes and house made croutons. Your choice of dressing. Two house made crab cakes served on top of a bed of spring mix salad, red onions, tomatoes & avocado. served with sweet chili sauce and honey mustard dressing on the side. House battered chicken strips served on a bed of romaine lettuce, red onions, tomatoes & blue cheese crumbles. Served with blue cheese dressing. Two generously filled corn tortillas served with chips, salsa and black beans on the side. Add another taco of the same kind for $4. Add avocado for $1. Beer battered cod, jack cheese, shredded cabbage, and tartar sauce. Mesquite grilled cod, jack cheese, cabbage, diced red onions and cilantro lim crème sauce. Local pink shrimp, jack cheese, cabbage and chipotle crème sauce. Sautéed red bell peppers, mushrooms & onions with jack cheese, avocado, diced tomatoes, cabbage & chipotle cream sauce. Lightly beer battered and fried with jack cheese, topped with cabbage & tartar sauce. We use Oregon's own Painted Hills Natural beef, seasoned, hand pressed, flame grilled and served on a fresh baked Kaiser roll. All served with our house cut french fries, substitute beer battered onion rings instead of French Fries for $3. Add avocado, sautéed onions or mushrooms for $1 each. Change any beef patty to a bean patty for no extra charge. 1/3 lb Painted Hills patty with all the classic veggies. It's a cheeseburger with all the classic veggies. You pick: Swiss, cheddar, Monterey jack, pepper jack or blue cheese. Two slices of bacon, choice of cheese and all the classic veggies. Grilled chicken breast, Monterey Jack, lettuce, tomato, red onion & cranberry BBQ. House made spicy black bean patty topped, Monterey Jack, avocado, sautéed onions & chipotle mayo. 1/3 lb Painted Hills, melted blue cheese, sautéed onions & mushrooms with all the classic veggies. 1/3 lbs Painted Hills, 2 thick slices of bacon, pepper jack sautéed onions & chipotle mayo with all the classic veggies. Not for the faint of heart. House battered chicken, 2 thick slices of bacon piled high with blue cheese crumbles, tomatoes, onions, lettuce & pickles. All baskets served with fresh coleslaw & house cut French Fries. Substitute beer battered onion rings instead of fries for $2. Wild Alaskan caught halibut, house beer battered and fried. Served with tartar or cocktail sauce & lemon. Pacific cod, house beer battered and fried. Served with tartar or cocktail & lemon. Freshly beer battered & fried slices of chicken breast Served with your choice of dipping sauce. Tender calamari steaks stripped, house panko breaded and fried. Served with cocktail sauce & lemon. Half dozen prawns prepared either garlic sautéed, beer battered or chilled. Served with cocktail sauce & lemon. Tender pink shrimp buttermilk breaded and fried. Served with cocktail sauce & lemon. Three house made crab cakes with fresh dill. Served with sweet chili sauce & lemon. Half dozen large oysters, dusted in flour and grilled. Served with cocktail sauce & lemon. Please let us know if you'd like them well cooked. A little bit of everything. Beer battered cod, Alaskan halibut, two grilled oysters, calamari strips, popcorn shrimp, clam strip & a Dungeness crab cake. Served with a trio of dipping sauces. Al served with house cut French Fries and coleslaw. Substitute beer battered onion rings instead of fries for $3. Beer battered Alaskan Halibut, jack cheese, lettuce, tomato & red onions. Served on a fresh baked Kaiser roll with house tartar sauce. Three local oysters dipped in flour and grilled, shredded cabbage, onions & tomatoes. Served on a fresh baked Kaiser roll with house tartar sauce. Local pink shrimp, Monterey Jack cheese, lettuce, tomato & sautéed onions. Served on a fresh baked Kaiser roll with 1000 Island dressing. House made Dungeness crab cake with fresh dill, lettuce, tomato, avocado & sautéed onions. Served on a fresh baked Kaiser roll with house tartar sauce. *Consuming raw or under cooked meats, poultry, seafood, shellfish or eggs may increase your risk of foodborne illness. We have a full bar and are trained professionals, please take advantage of your current situation. Hendricks Gin, house simple and squeezed lemon topped with champagne. Monopolowa, St. Germain, guava and fresh squeezed lime. Monopolowa, squeezed lemon and house simple with a sugar rim. Mono, squeezed lime & ginger beer in a copper mug. Oregon Crater Lake Vodka with house stuffed blue cheese olives. Souza Silver Tequila, Harlequin, house simple syrup and fresh squeezed juices. Pendleton whiskey & Root Beer. A traditional Mai Tai, Meyers Dark Rum, Bacardi, Apricot Brandi, Harlequin, squeezed lime & house simple. Squeezed grapefruits & Monopolowa Potato Vodka. Hornitos Silver Tequila, squeezed grapefruit, house simple syrup & soda water. Malibu Coconut Rum, Blue Curacoa & pineapple juice. Bacardi and blended natural fruit puree; strawberry, mango, peach raspberry or Piña Colada. Monopolowa Potato Vodka and fresh squeezed oranges. Monopolowa Vodka, house bloody mix, house stuffed blue cheese olives. New Belgium Glutiny Pale*, Widmer Hefeweizen, Rogue Honey Kolsch, Kona Big Wave Golden Ale. *These beers are gluten free!! Your event is our event. Whether it's a special occasion or a casual get together with friends, Shark Bites can cater your event. With our personable staff and delicious seafood dishes, we make sure you never have to worry about the quality of taste and professionalism of staff. Looking for an event venue? Shark Bites can accommodate 75 to 100 people in the Theatre located right next to the restaurant. Call us (541) 269-7475 daily from 11 am to 9 pm to reserve a table.